A visit to this delightful spot may take an hour or a day. Whatever the duration, it’s a wonderful place to visit and interesting on many counts; the peaceful setting, the architecture and the history of both the 11th century church and it’s predecessor, dating back to ancient times. The current monastery was founded in the 11th century A.D. and consecrated to the Presentation of the Virgin in the Temple. It was named for the nearby spring, known as kaisariane, which Hadrian used to supply Athens with water. Then and now it has been credited with healing powers, particularly for women who desire to bear a child. The water still flows from an ancient ram’s head in the courtyard of the monastery. The Kaisargianni church with the chapel of St. Anthony in the center, is actually built over the ruins of classic Roman temple and some of the fragments are incorporated into the church’s architecture. 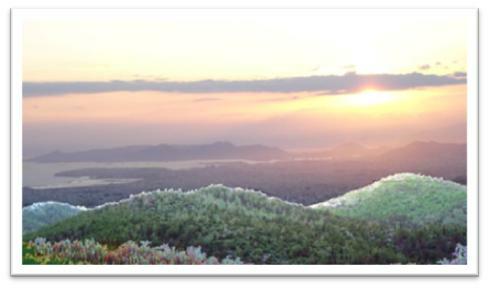 Mount Ymittos overlooks Athens, the suburbs, the surrounding mountains and the sea from its home on a wooded slope a few miles from the suburb of Kaisargianni. A short walk from the roadway below the Monastery brings one to small open grassy path surrounded by Cypresses, with worn stone steps and masses of natural green carpet and wild flowers. There is a cluster of greenery, including the delicately beautiful Maidenhair fern (Adiantum) which grows wild and thrives around natural springs. As with many Byzantine monasteries, Kaisargianni is well fortified, and thus a high wall surrounds the monastery which encloses the convent buildings, the Katholikon church, the refectory, the bathhouse and the monk’s cells. The aura of tranquility is inspiring in this charming spot. The water of the “kallia” fountain to the left of the monastery’s entrance, holds another spring, nestling in a small alcove, water tumbling from a marble Ram’s head of the Roman period. The Ram’s head caused the Turks to name the monastery after it: Kots-Bashi, and in later times the monastery was known as “Syriani”, how it became known finally as Kaisargianni is unclear. The history of the monastery indicates that in the 12th and 13th centuries A.D. the convent was rich and prosperous with monks engaged in apiculture, the rearing of bees, and the honey produced was their chief source of income. If you walk to the monastery from our Pagrati penthouses or from the bus stop near the cemetery, the path on the left side of the road passes by a number of bee “farms”, and you may find someone from the monastery sitting in solitude, tending to the bees. At the apex of its prosperity, the monastery was a cultural center for the whole region. It owned a rich library and its abbots were renowned scholars and teachers. Sadly the books and precious parchment manuscripts of the library were transported to the Acropolis along with the books from the Metropolis Cathedral, and were used to ignite cartridges towards the end of the war of independence. The leading nobility of Athens were associated with the monastery. This included the Venizelos family, whose members remained powerful during the period of the Turkish rule. The tower built by the Venizelos family is still within the monastery walls. Since many influencial Athenian families had property on the mountain, they had these towers built to watch over and supervise their estates on Mount Ymittos. The Kaisargianni Monastery was built in the 11th century on top of the foundations of an ancient secular building of an unknown period. Apart from the main church and bathhouse, which are original 11th century structures, the bell tower and St. Anthony chapel were added later, during the Turkish occupation. The buildings are set around a courtyard and enclosed by a high wall. On the east side is the church, the west side the refectory and kitchen and on the south the bathhouse, converted into an olive press in Turkish times. No doubt olives were another source of income although history doesn’t mention this. Beside the bathhouse (or olive press) are several other buildings including the monk’s cells. The square structured Venizelos Tower with an external stairway built against the façade stands in the center of this area as well. Kaisargianni is characteristic as an 11th century edifice by its proportions: the narrow side bays and the dome with its very tall drum, pierced by eight windows. The dome is supported by four columns taken from the ancient temple that previously occupied the site. The walls and the ceilings are decorated with colorful murals, with scenes from the bible depicting the birth, the Baptism, the Ascension, the Presentation, the Last Supper and even the Good Samaritan. Few walls remain undecorated. The church was laid out in cruciform with the high central dome providing a sense of loftiness. Look closely as you wander through the buildings. Ancient stones and carvings were incorporated into the building of the church and surrounding structures. Marble elements form a 5th-6th century Early Christian Basilica, the reliefs and fragments of which were also used to embellish the Kaisargianni church, serving as ornamental lintels or incorporated in the exterior west wall of the narthex. In the restored panels of the iconostassis, were pieces from this early Basilica. 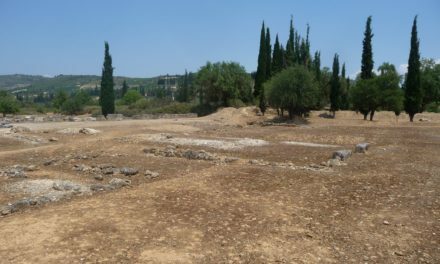 The Kaisargianni bathhouse is one of the few examples known from the period (another is at Dafni, on the other side of the city as you drive toward Delphi, which is currently closed to the public) and bears witness to the monastic rule which specified the frequent practice of ablutions, the ritual cleansing of the hands and body. It is constructed much like a Roman bath. The Refectory and kitchen are housed together in a single building by the western wall opposite the front of the church. The arched wall outside of the monk’s cells from the cloister and the green surroundings, trees, shrubs, plants and undergrowth, add to the beauty of the warm colored brick. Cypresses stand tall behind the church as if to add their own stately protection. 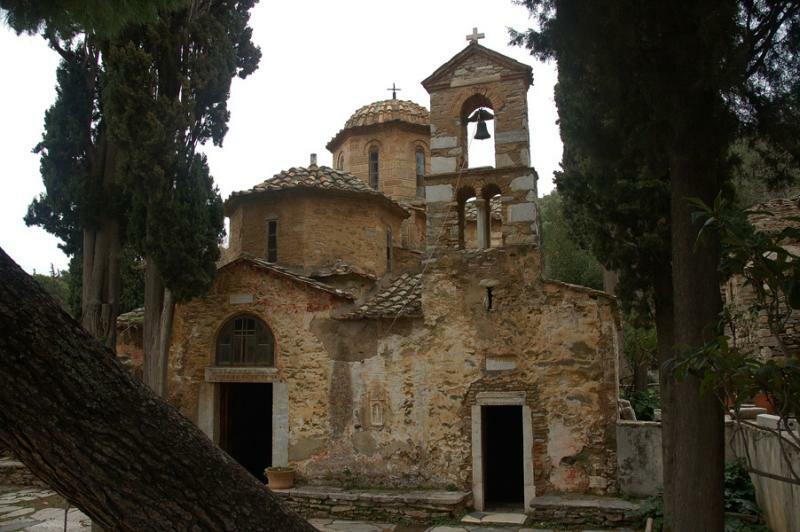 The monastery is currently a museum maintained by the Greek Ministry of Culture and the hills surrounding it are protected by an organization called “Friends of the Trees”, very appropriate considering most of the area is wooded. When monasteries were built years ago, they were built to be self-sufficient and isolated. 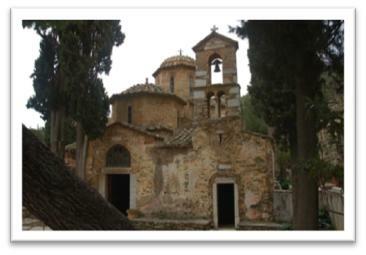 Kaisarrgianni Monastery is in the perfect spot for this, unseen from below, yet having a clear view of its surroundings. It was last inhabited in 1922 when the remaining monks fled the monastery. To visit the Monastery from Syntagma, the quickest route is by taxi– though you’ll miss the lovely walk through the forest, the beekeepers along the way and an interesting local cemetery. A taxi from Greek Vacation Rentals penthouses will cost about 4 – 5 euro. You can take a taxi up to the monastery and take the path down the hill after your visit. You can take a bus, which lets you off about 1 mile from the monastery. There are also taxis waiting by the bus stop, if you really don’t want to walk at all. To reach the bus from Thissio: Every 20 minutes, bus no. 224 leaves from Plateia Kaningos on Academias and from Panepistimiou and Vas. Sofias, northeast of Syntagma Square. Ask the driver to let you know where to get off for the “Moni Kaissargianni”. By foot – I walked this with our dog, Scruffy and a friend just recently, and our entire journey lasted 3.5 hours, including our little picnic, watching a beautiful sunset over the city and stopping in Kaissargianni Square for coffee before returning home. We left from the center of Pagrati at Ymittou and Chremonidou and walked down Ymittou to Forminos, crossed it and turned right on Ethnikis Anastasios. We continued all the way down this road, stopping at a lovely Cretan Market where they sell all sorts of food from Crete. We bought a bottle of wine, some cheese and sausage, and continued onward, stopping again a few blocks down at a bakery for some bread. We walked along the right side of the road until it curved where the park started, and then we cut into the park and walked through a stone path, which led us to another path through the woods. Eventually we came upon another monastery, called Holy Monastery, (don’t be confused, for a long time I thought this was Kaisargianni Monastery, it is not). This path is a bit crude, so be sure that you have decent walking shoes. As you walk you’ll realize that you are actually between two roads, and it you go to the edge of the hill on your left, you’ll be looking over at the University. The path ends near the exit to the highway. Continue walking under the overpass, and you’ll be on the road that leads to the monastery. 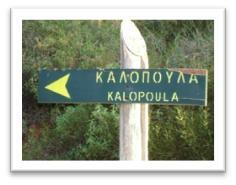 You’ll see a guardhouse, and a few yards past this on your left is a sign pointing to KALOPOULA. 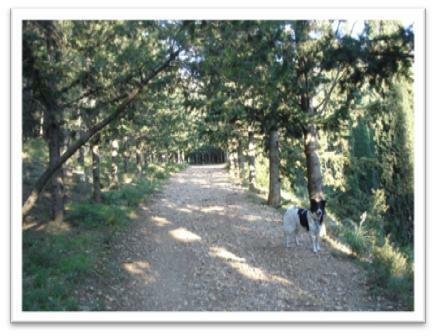 You can take this path, which gets you off the main road and offers a peaceful walk through the trees. Be sure to take a picnic along – there are a number of beautiful sports to sit and enjoy the quiet views overlooking the city and out into the sea. As you wander about, watch for the signs that say “Taxiarhis Point”, they’ll be pointing to your right, keep following them as they will lead you to an amazing view of the city, the sea and the islands in the Saronic gulf.